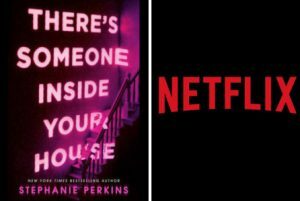 kt literary » Blog Archive » THERE’S SOMEONE INSIDE YOUR HOUSE at Netflix! THERE’S SOMEONE INSIDE YOUR HOUSE at Netflix! the streaming giant beat out multiple studios to the red-hot pitch based on YA author Stephanie Perkins’ NYT bestselling novel about a young girl whose high school friends inexplicably begin to die in a series of gruesome murders. This one is similar in tone to Netflix’s Stranger Things: think 1980s and ’90s slasher movie meets a John Hughes coming-of-age tale like The Breakfast Club. This is a match made in heaven, as far as we’re concerned. Feel free to send Steph congrats on Twitter or Instagram!